The Tite Front, or 404, has become all the rage when it comes to defending the spread. From Georgia in the SEC to Appalachian State in the Sun Belt, defenses across America are turning to the front to shut down offenses that use space to spread the defense out. The main objective of the Tite Front is to close the B gaps, reduce conflict for edge defenders and constrict the box so plays are forced outside to free hitting players. 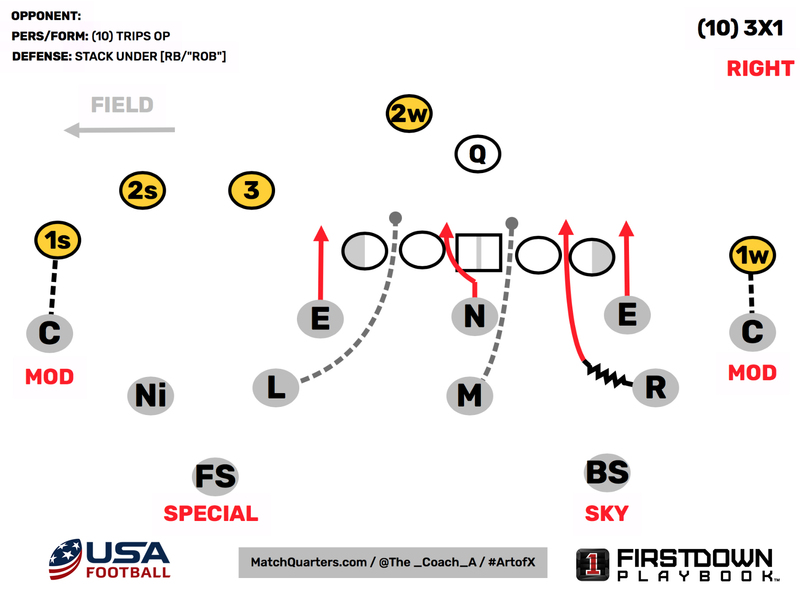 The prevalence of the front is forcing offenses to get creative on how to counteract it. In order to stay ahead of the curve defensively, a coach cannot live in one thing. Even if a defense bases out of the Tite Front, it cannot live in it 100 percent of the time or it will get exposed. One thing is clear, modern defenses have to vary in what they do, or at least give that illusion. The future of football is in the hybridization of schemes. Whether basing out of an Odd Front or a four-down, modern offenses are forcing the defensive side of the ball to get creative. Static fronts and coverages will get a team beat. Defensive coaches across the country are searching for a way to keep the defense simple, yet fluctuate at the same time. What seems like an oxymoron is actually relatively easy to install. 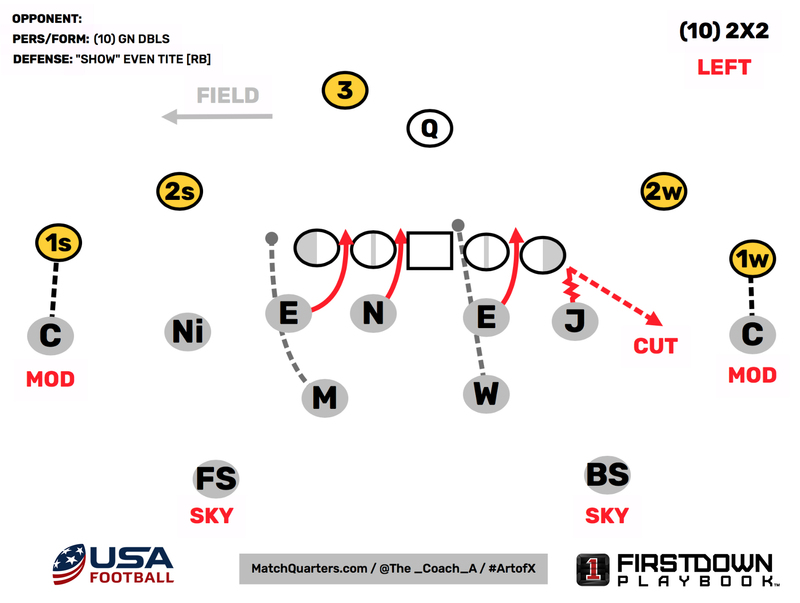 Stealing from our offensive counterparts who package plays all the time, a defense can do the same in three easy steps: 1) Utilize sub-packages, 2) “Bait-n-Switch” and 3) Mesh concepts from different schemes. The goal of this article is to illustrate how a modern defense can base out of the Tite Front, yet feature multiple looks. The use of sub-packages has always been a way for defensive coaches to get different players on the field to counteract what the offense is doing. One example of this packaging is shown above. Don Brown, the current defensive coordinator at Michigan, uses packages to make the offense work. Like formations in an offense, sub-packages force the offense to account for them and track how the defense utilizes the scheme. By utilizing a 3-3 Stack, Brown can get into his base Over Front by blitzing an ILB. Above, the Lou backer inserts into the B gap while the nose crosses the center’s face. The end result is the same gap responsibilities as an Over Front. For Tite Front teams, this can easily be done in the same way by shifting the LBs to a stack (Mike is Lou, Will becomes the new Mike and the Jack becomes the Rob). If utilizing a hybrid DE/OLB in the Jack position, a coordinator would only have to insert a backup ILB as the Rob in place of the Jack. Now the offense has to account for a new scheme and a simple pressure. The packaging works against all formations. If a team wants to run an Over to a 2x2 formation, the strong-side LB blitzes. Against Trips, a defense may want to run an Under Front. Now the Rob would insert. This keeps things really simple. 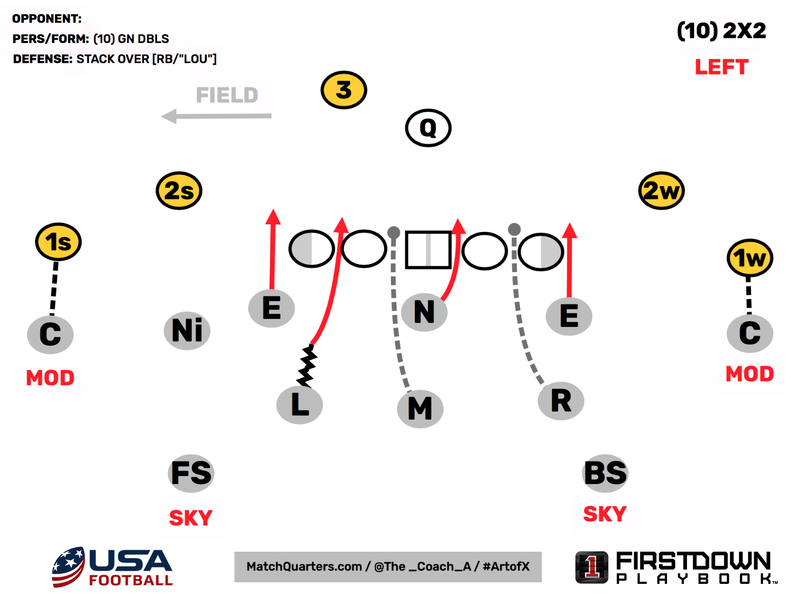 The Mike, who usually sets the front strength anyway, only has to give a simple “left” or “right” call, prompting the corresponding LB to blitz. The DL doesn’t change from their Buck Front (505) and the Nose goes opposite. The nice thing about this simple adjustment is the coverages don’t change. A defensive coordinator can even switch what front they want series to series. Regardless, the offense has to account for a different look, while the run fits and coverages for the defense remains the same. Simply lining up in a front and moving to another post-snap is nothing new. Defensive coaches stem to fronts all the time. One thing a modern defense needs to be able to do is get into different fronts to give the offense something to think about. Post-snap movement assists in the defending of the Spread because it muddies the reads for teams that run read-option plays. In the diagram above, the defense comes out in what appears to be an Even Front, or two 5 techniques and two 2 techniques. The use of 2 techs does several things for a defense. First, the head-up alignment doesn’t tip off where the D-line will move to. The offensive line has to guess or react post-snap. 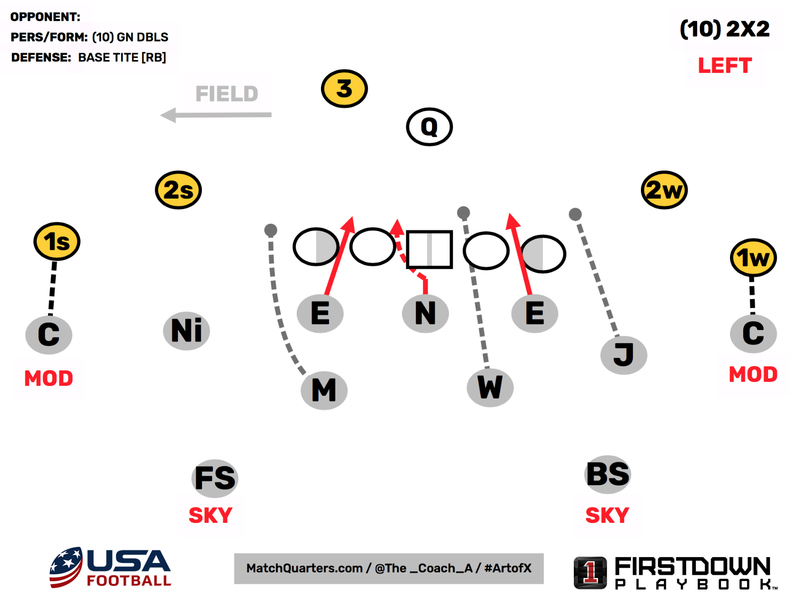 Second, the Even Front utilizing three-down personnel allows the coordinator to get into a multitude of fronts without the use of dense verbiage. For instance, the call in the diagram is “Show Even Tite.” Show the Even Front then move to a Tite Front post-snap. Simple and easy. The attached Jack also gives the simulation of pressure to the offensive tackle. This can assist the DE to his side by forcing the tackle to honor Jack, only for the DE to dart into the B gap behind him. The diagram above is actually a marriage of three different schemes. The front, is a four-down Over Front and is used primarily as the main way to defend 10 pers, 2x2 formations when running a four-down front. The use of the Mike as the edge defender to the field comes from the use of an Odd Stack concept of rotating the stack backers, or what is referred to as a “broken” Stack. The Jack moves back to a hipped position and can fold into the B gap. This aligns with his fits anyway where he can work the edge as well as drop into the curl. Most hybrid defenses, as stated above, use a hybrid player at the Jack position. Finally, the Will is the A gap player. 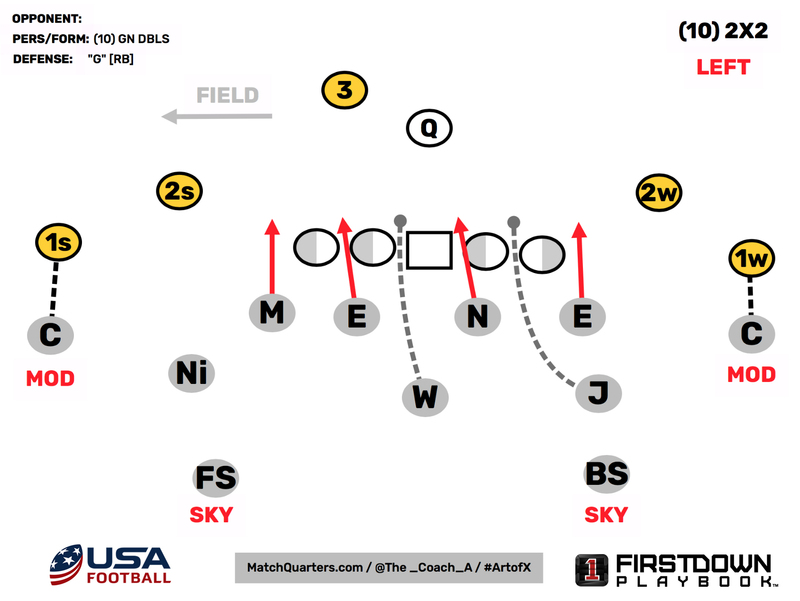 In most 3-4s, the Will is the “plugger” and responsible for a single back, while the Mike is the hybrid player that can run. Most Odd Front defenses will find a way to send a fourth rusher. This essentially turns the scheme into a four-down front. Aligning that way from the get go and using different concepts from other schemes can challenge an offense. The marriage of schemes is where the future of football is headed. Staying in static schemes against modern offenses will get beat. A modern defense has to be able to flex and adapt to what it’s seeing week-to-week or even series-to-series. What this article was built to illustrate are simple ways to hybridize an Odd Front. Using simple manipulations and stealing from other concepts can create doubt in an OC’s mind. The ability to muddy the reads and challenge a modern offense is key to the success of a defense. At the end of the day, be creative and come up with simple tweaks to your alignments that can translate through a scheme. Whether it is a simple sub-package to change the players on the field or placing a LB where you normally would have a D-lineman, be creative. Finally, decide where you want to end up post-snap and create ways to bluff where the defenders might come from. By building packages congruently, a defense can switch from one to the other without losing scheme, keeping the structure the same. Get started with the complimentary Shoulder Tackling System and access 22 drills.